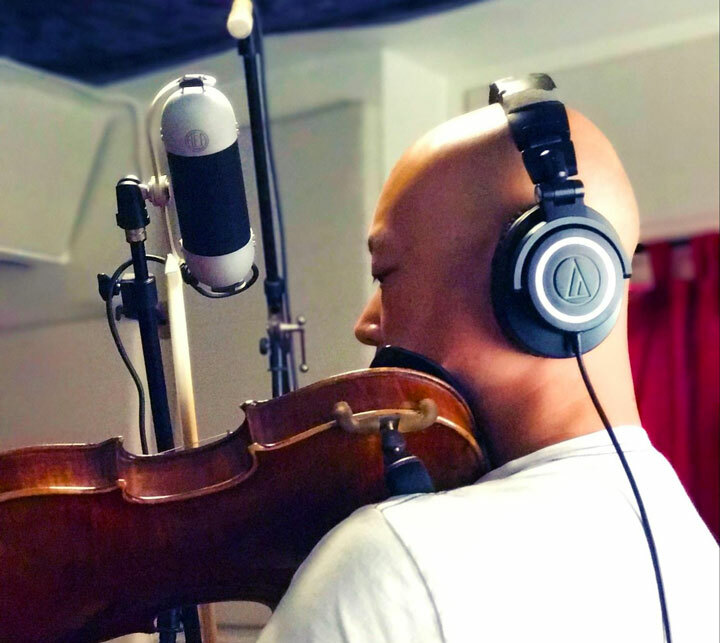 Setting up your microphone for orchestral string instruments — whether that’s a violin, viola, or cello — can be a balancing act. If you get too close to the instrument, it can sound boxy and shrill. If you’re too far away, you may hear an unappealing room tone more than the instrument. The good news is that there are some simple guidelines for choosing the right mic for the job and placing it so that you capture only the sound you need. The best guidelines for placing a mic are also fairly simple to follow. Place it one to three feet away from the instrument. Position it out and up from the instrument. Point it toward the area where the bow plays. Large diaphragm condenser microphones (in a cardioid pattern) generally sound good on violins, violas, and cellos alike. A close ribbon mic sounds great in combination with a small or large diaphragm mic (at more of a distance). A string player in a room (even if the room is a bit live) will generally sound better than in a small recording booth. Those are the basics, but there are plenty of factors you can consider to get the best recordings possible, whether you’re recording at home or in a studio setting. If you’re doing a home studio recording or working in a small recording space, close mic’ing with one or two mics is your best bet. 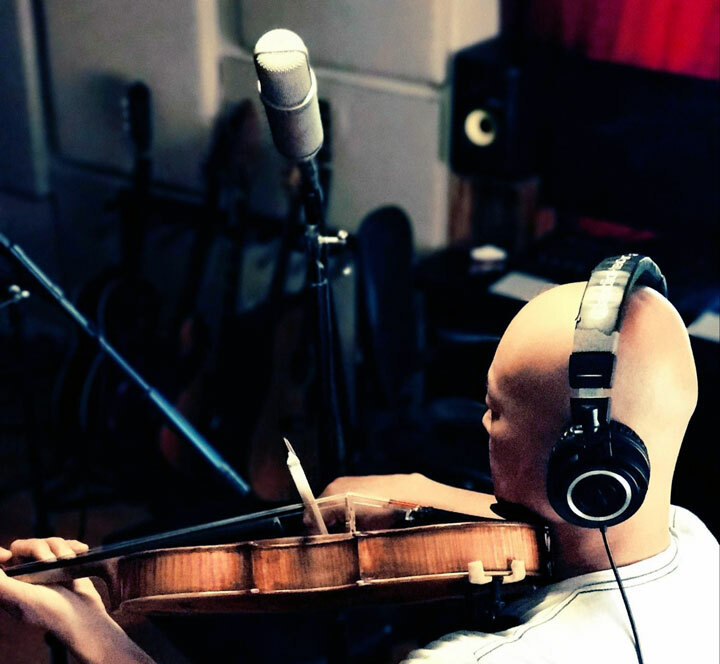 Tiny rooms (like closets) and small recording booths aren’t ideal for string players. That’s not just because the instruments need an optimal amount of space to sound good, but because you’ll want the player to have enough space to move her or his bow freely. If you have the option, use a room that has some size to it, like a living room or a live room at a studio. Dead rooms aren’t necessarily better when it comes to strings. If you’re recording in a large live space (such as a concert hall), that’s a different topic altogether. 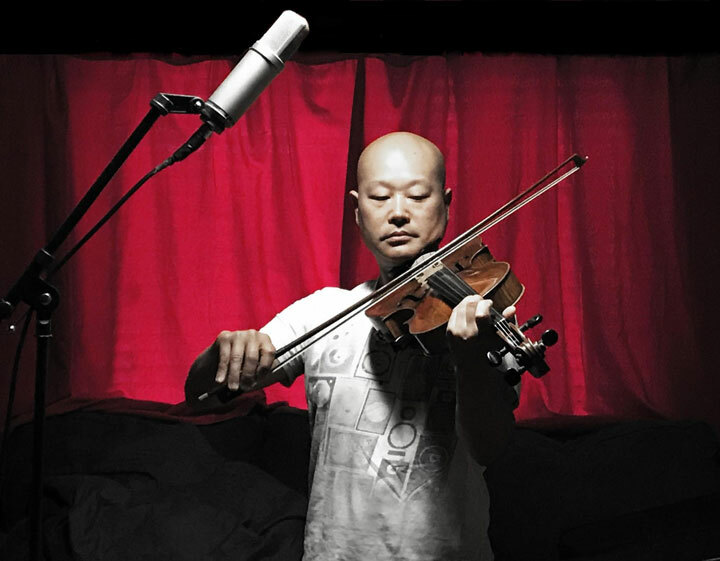 Likewise, there are specific techniques when recording classical music, where stereo mic’ing is the norm. The following mic techniques, therefore, are all focused on recording in a decent–sized room in a home or a studio. The type of microphone that will generally sound good on any violin, viola, or cello in a home or studio recording is a condenser microphone. These have the best frequency and transient response of any type of microphone, meaning that it can clearly pick up the entire range of high and low frequencies of the instrument when placed well. It will also pick up overtones, resonances, subtleties in timbre, and the sound of the physical instrument itself. This can be good and bad. Detail and subtlety may sound great or might be a problem, depending on the situation. With a close condenser mic, you’ll hear everything from a player sighing loudly to a piece of jewelry or clothing rattling against the instrument. Cellists with buttons on their sleeves or violinists wearing long earrings or jewelry are common culprits of unwanted noises. There are two types of condenser microphones: large and small diaphragm. Small diaphragm mics are more accurate and capable of capturing higher frequencies beyond human hearing. Large diaphragm condensers, on the other hand, are preferred for their richer low–end response. All microphones have a polar pattern, which is the area around the mic that it picks up. Some pick up 360 degrees (omnidirectional), mostly in front (cardioid), or in front and behind but not so much the sides (bi–directional or figure 8). Some condenser mics have an adjustable polar pattern, with either a switch on the microphone itself or replacement capsules that have different polar behavior. For string recordings, a cardioid pattern is an ideal place to start, but there’s room to experiment. In some spaces, you may want subcardioid, hypercardioid, or even omnidirectional. Ribbon microphones can also sound fantastic on strings. These do not have a flat frequency response and naturally taper off on the high end. Strings sound warm through a ribbon mic and are capable of being mic’d closely without some of the extraneous noise of a condenser. There are a couple issues working with ribbon mics, though, such as low output. A ribbon mic needs a good quality mic preamp that can provide high gain (which comes at a cost). A ribbon mic may not work well in a less–than–ideal reverberant room since it has a figure 8 polar pattern that will pick up those reverberations happening behind it. Cheap ribbon mics, for that matter, are inconsistent. Ribbon mics take a level of detail to build, and not all manufacturers have the same level of quality control. All in all, if you want to use a ribbon mic, it will be an investment — albeit one worth the cost. 2 to 3 feet away from the instrument. Out and up from the instrument. Imagine the sound projecting out at the same angle as the face of the instrument. Pointed toward the area where the bow plays, somewhere between the end of the fingerboard and the bridge. A nice combination is a close ribbon mic (one to two feet from the instrument) and a small diaphragm condenser microphone a couple feet behind it at the same angle. The same rules apply as with a single condenser for positioning: picture the sound going out from the face of the instrument and place the mics along that plane. The mics need a little distance between each other. If they’re too close, you’ll get a clashing delayed, comb filter sound when they’re mixed together. When placed properly, the two mics blended together will have a lot flexibility in a mix. The ribbon mic provides a closeness and warmth and will be close enough to minimize the sound of the room. The condenser will add crispness without capturing the extraneous noises of the instrument. Harsh bow noises. Bow strokes, like spiccato, sound crunchy. Lack of balance between strings. This happens because the mic is favoring some strings over others, or when the player is moving. Body resonances of the instrument that stick out. Every instrument has resonating frequencies, or pitches that cause the instrument itself to vibrate more than others. As a mic is moved away from the instrument, these frequencies mellow out and the instrument sounds more even. These can also be adjusted in the mix with an EQ, but it's easier to just place the mic well. You hear the player moving around. String players tend to move as they play, some more than others. If the mic is too close, you may hear the player going off axis or backing off the mic. Too much of the room. If you can tell the size of your room or hear a lot of room tone or air, your mic may be too far away from the instrument. Little or no bow definition. 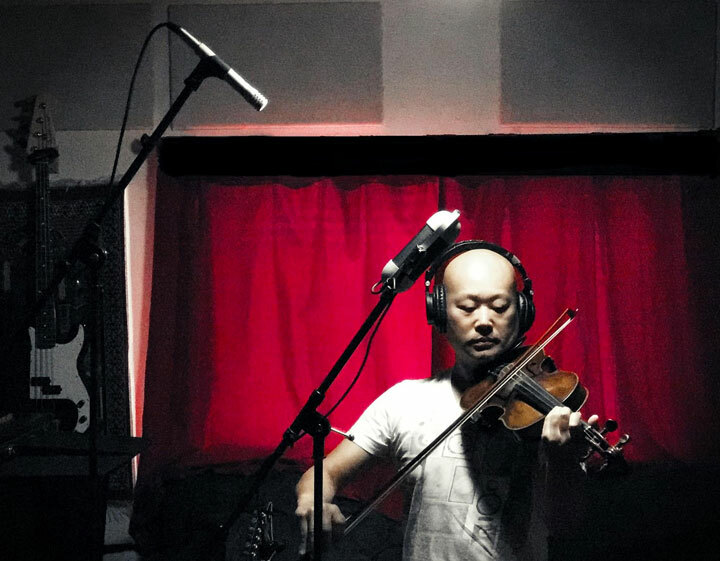 If the mic is placed well, you’ll record a slight buzzing or sizzle sound (the sound of the bow making contact with the strings), but not an excessive amount. No low–end. If the mic is placed too high or off–angle, the instrument’s sound can be thin. Lack of definition on some articulations like pizzicato, staccato, or ricochet. If you generally aren’t happy with the sound, experiment by moving the mics 6 inches in a single direction (up, down, closer or further from the player) and listen. Then move another 6 inches. Eventually you’ll find a sweet spot that works for the instrument. There are colors you can capture in a recording that an audience will never hear at a distance." You can experiment with placement by leaving the mic in place and stepping closer or further away. You can also adjust the height of the mic and listen to the recorded results. Ask yourself, do you hear more or less low–end? Is there enough definition or too much bow noise? Can you adjust how you’re playing to get better tone or creative textures in the recording? There are colors you can capture in a recording that an audience will never hear at a distance. Good quality rosin can reduce bow hair noise in a recording and the type of bow hair can affect the sound, also. When you’re setting up a mic stand you have to think about placement so your mic or stand doesn’t get hit by a bow. Ask the player if your mic or mics are in their way at all. If the mic placement doesn’t sound good to you, try listening to the player in the room. You may want to try putting your ears in the area where the mic is, which will entail standing on a sturdy chair when the mic is properly placed above the instrument. The “sweet spot" varies for every instrument, and if you can find it with your ears, you can move a mic into place. The player is also a great resource. Have her or him listen to a test recording and give an opinion on the sound. Words like harsh or brittle might imply the mic is too close. Thin, weak, roomy, or noisy can be signs of a mic that’s too far away. If you’re using a two–mic technique, try experimenting with the mix, adjusting the levels between the close and the far mic to see if you can achieve a better balance. In general, playback sounds better with reverb.